Doing anything reeeeally fun on the last day of April? 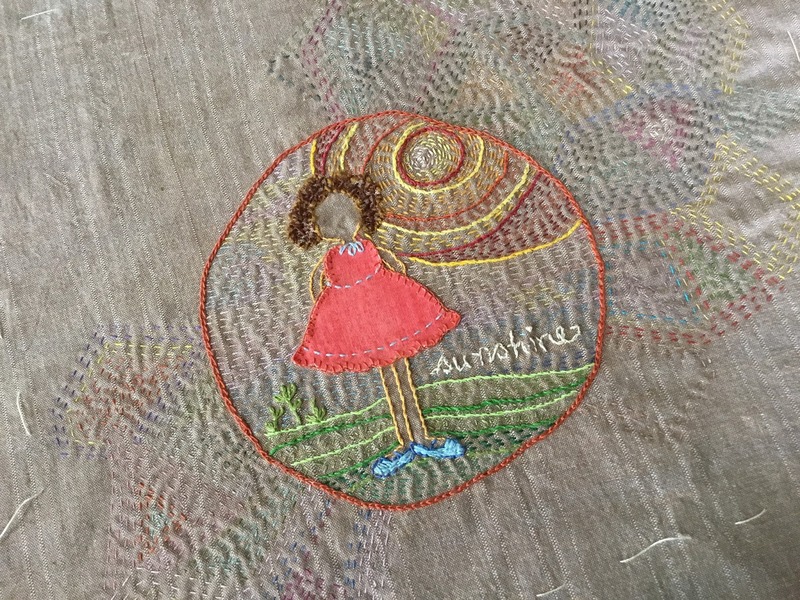 If not, why not join me for a few hours making woven fabric art!?! I’ll be teaching the Art Weave technique at Chattanooga Sewing Machines and More on Monday, April 30. Two class times are available: 10 am or 6 pm. Minimal supplies are needed to create a maximum amount of “flower power” with these beautiful large scale fabric prints. Kits are available with the class. Call the store today to get in on the fun. Art Weave with large scale flower designs. These flowers bloom year ’round... rain, shine, day and night. 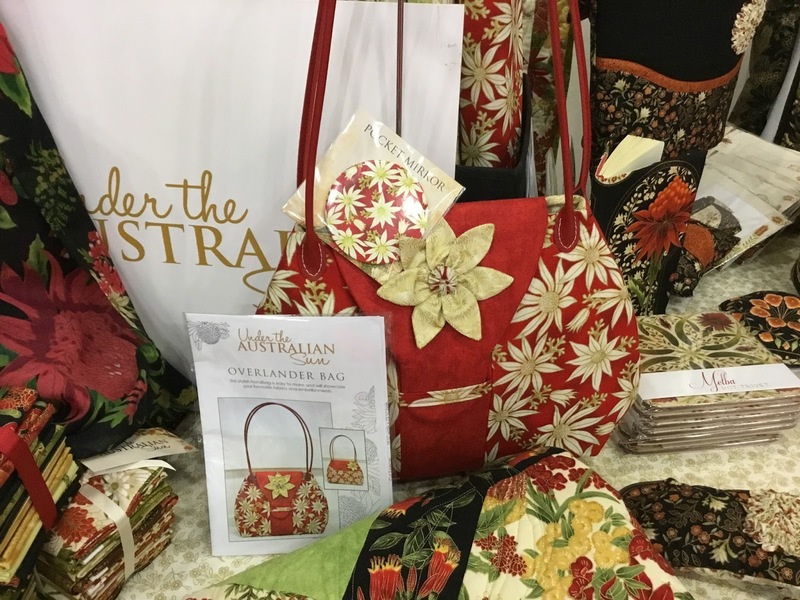 The room was filled with nearly 70 guild members and visitors that attended my “From Field to Fabric” lecture and a trunk show at the Madison Station Quilters guild meeting last week. It was a lively evening! 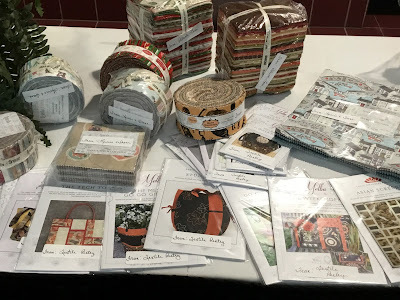 An enthusiastic and inquisitve group of quiltmakers and several garment sewers asked thoughtful questions about the fabric manufacturing processes as well as the fabric samples that I brought for Show and Tell. 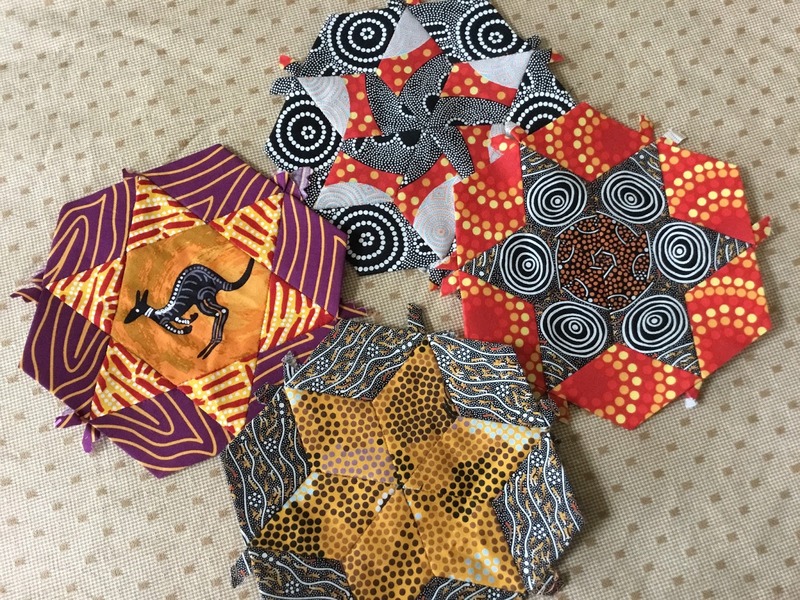 English paper pieced hexagons with aboriginal fabrics from M&S Textiles Australia. Kantha hand emboirdery on yarn-dyed textured woven from Diamond Textiles. and did a show and tell of four unquilted quilt tops. M&S Textiles and batiks from Majestic Batiks. I did have two completed quilts that featured fabrics from Lewis and Irene, a UK fabric company that just established its USA division in October 2017. 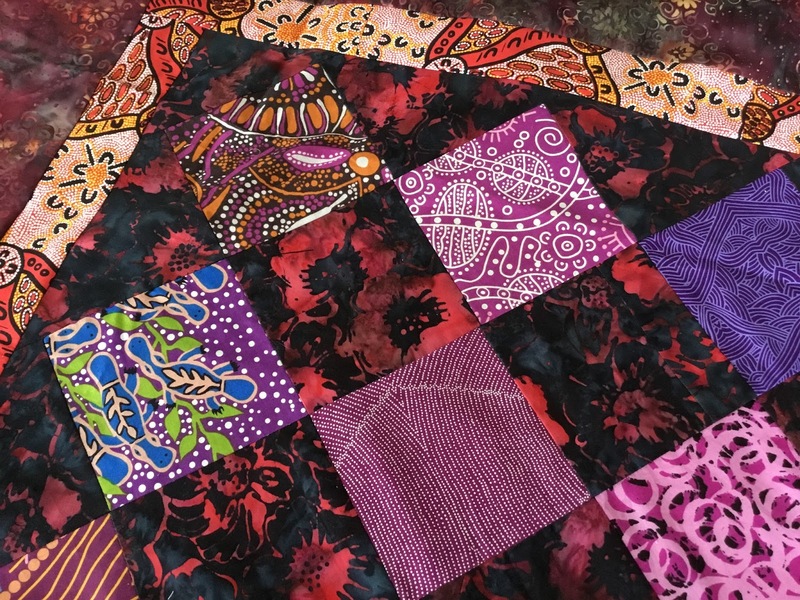 This little quilt has machine trapunto and mixes fabrics from Lewis and Irene, Art Gallery, and the border is an aboriginal print from M&S Textiles. Machine trapunto "Enchanted" quilt featuring Lewis and Irene fabrics. From Diamond Textiles: Woven Elements, Primitive Rustic, and Primitive Stars were the top vote-getters followed by Embossed Cottons, Kalamkari, Nikko Earth, Picket Fence. The wildly popular ikat fabrics got write-in votes! 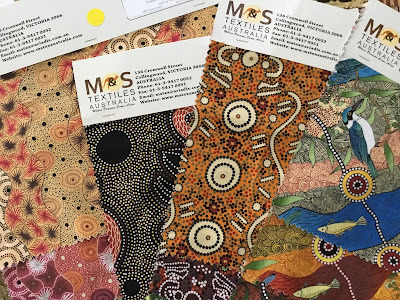 From M&S Textiles Australia: all the prints were well received with specific requests for Spiritual Woman, Kingfisher, Wild Bush Flower, Spirit Place, Rebirth Butterfly Spirits and Dancing Flowers. From Lewis and Irene: Bumbleberries, Geometrix, Lindos, and Celtic Reflections were top favorites followed closely by Water Meadow, Fairy Lights (glow-in-the-dark), and City Nights. Thanks again to Susan Yell, the guild's current President for the invitation, the two lovely volunteers that modeled my jackets, the quilt angels that held up the quilts and tops, the leadership team members that swooped in to help set up and then pack up my sample bags at the end of the evening, and to everyone who came out to spend the evening talking about quilting fabrics with me. Your excitement and overwhelmingly positive reception to the yarn-dyed textured wovens and hand printed kalamkari fabrics from Diamond Textiles, the bold colorful aboriginal designs from M&S Textiles Australia, and the contemporary “sophisticated cute” fabric collections from Lewis and Irene is contagious! I am pumped with a renewed interest in creating more quilts, garments and other projects with these fabrics and I hope you are, too. Please tell your local quilt shops [YLQS] that you are interested in these fabrics! 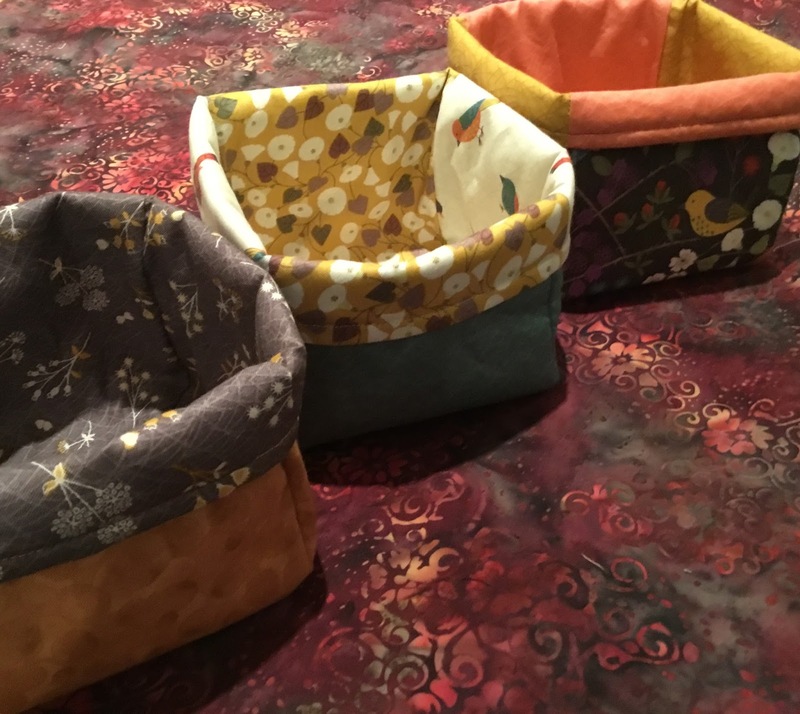 You are the fabric influencers for the quilt shops and independent sewing centers that you support. Forever ago (it seems), Susan from the Madison Station Quilters, invited me to give a presentation at her guild. The time has arrived for my speaking engagement: this Thursday (tomorrow), in Madison, Alabama, which is just outside of Huntsville. Bobbin work on yarn-dyed wovens from Diamond Textiles. With my presentation, I'll have a few of my pieces for a trunk show—quilts and garments. 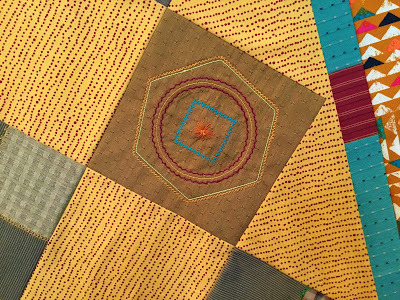 I’ve been exploring yarn-dyed fabrics in various capacities for about a year—with hand stitching, bobbin work, decorative machine stitches—and combining the yarn-dyed textured wovens with vintage and other printed quilting cottons. 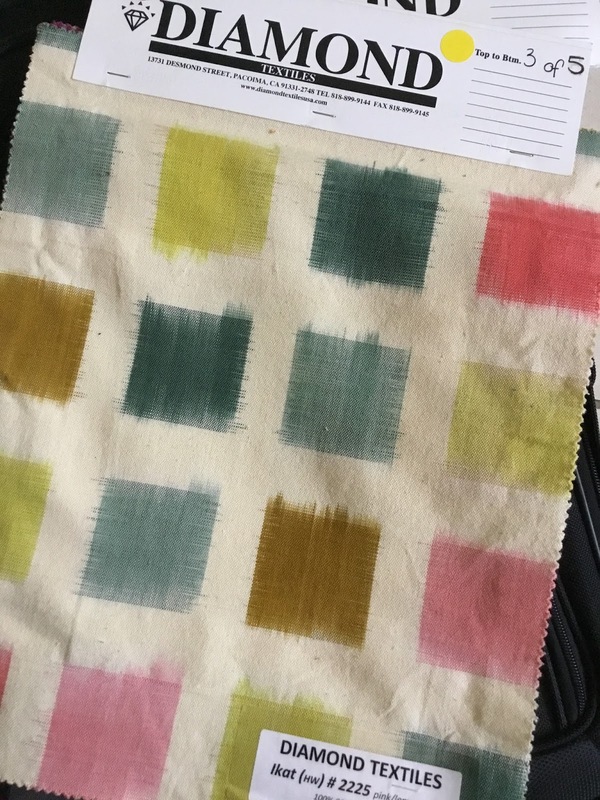 I'm finding the juxtaposition between the textures (one of the inherent characteristics) of the yarn-dyed wovens and the patterns of the printed cottons fascinating and refreshing... and in a way, sophisticated! Kalamkari block-printed cotton fabrics from Diamond Textiles. 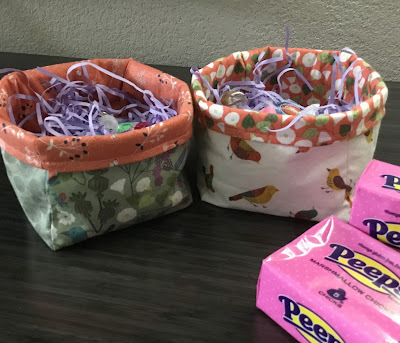 When I mentioned to Susan that I'd like to bring "show and tell" and some fabric samples to the meeting, she was excited. 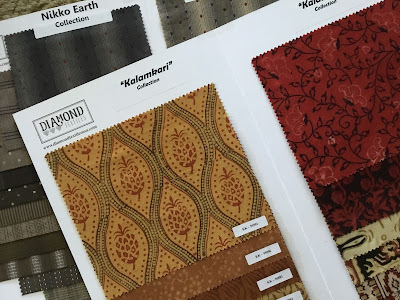 I said I'd like to introduce the guild members to a few new fabric lines (from the UK, India and Australia) and show examples. I hope to provide a different view and ideas for mixing fabrics. Another quilting friend calls it "patchwork fusion." Fabrics from M&S Textiles Australian. I am excited to see and hear the feedback from the Madison Station quilters. 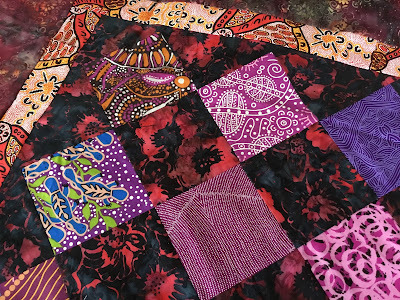 Mixing fabrics that are made in different parts of our world and inspired by different cultures is fun and exciting... and sharing ideas with fellow quilters is even better! Alabama, here I come. 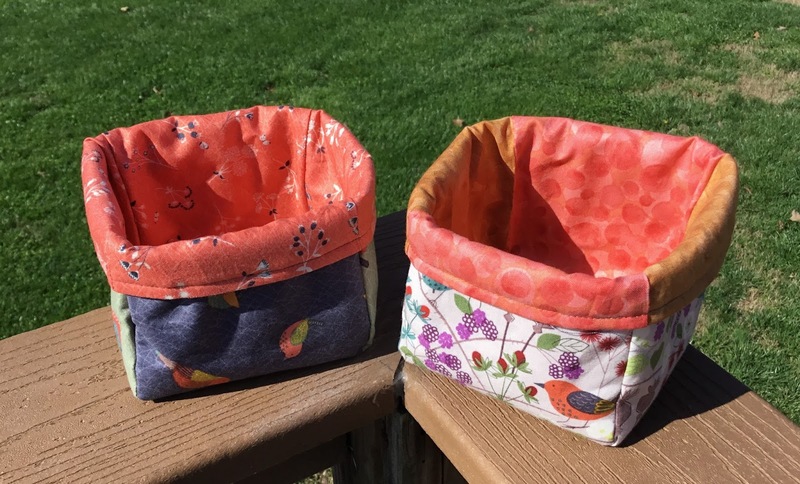 These little fabric baskets are made with the Melba Flower Basket pattern from The Textile Pantry. I’ve made several of these cute containers recently. They are fast and fun to make and an excellent distraction from the unseasonably cold, rainy and snowy weather we’ve been having for April. Melba Flower Basket, a pattern from The Textile Pantry. 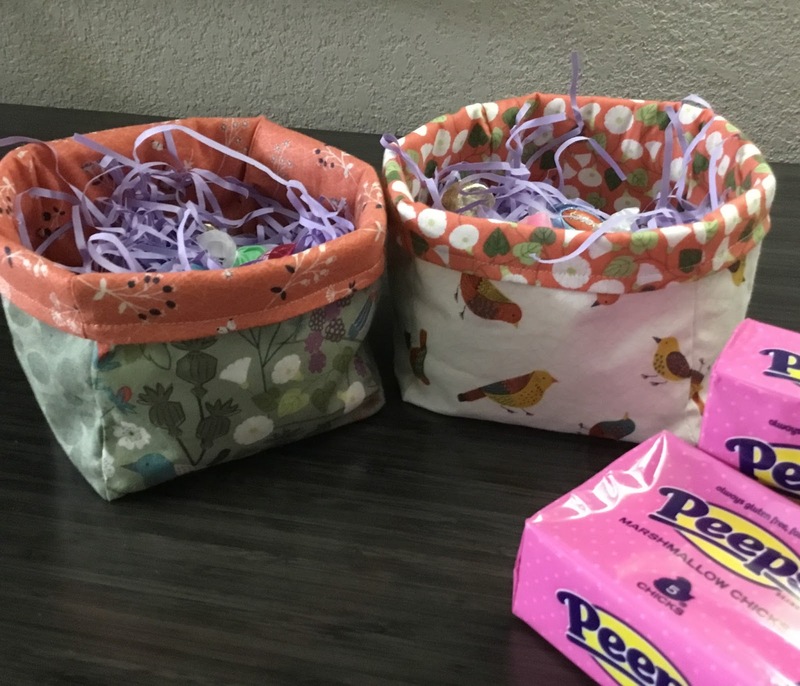 Fill them with candy and pop in some Peeps. Use them beside your sewing machine to hold small tools like a seam ripper and binding clips. Download the free Melba Flower Basket pattern at The Textile Pantry. 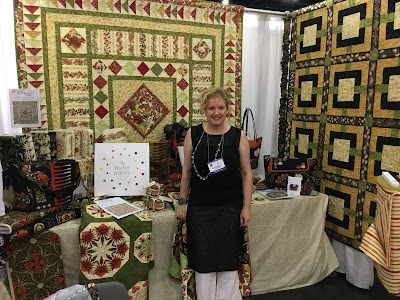 Leesa Chandler, the owner of and creative force behind The Textile Pantry, is a fabric designer, quilt shop owner, quilter, sewer, and pattern designer. She does it all! Her patterns feature her fabric lines that are inspired by the landscape of Australia, where she lives. 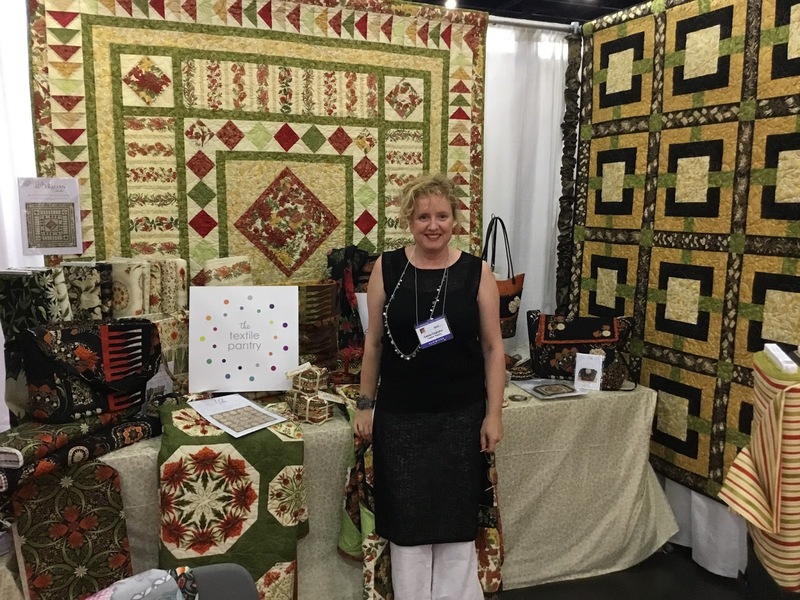 Here she is in her booth at Fall Quilt Market, 2017. 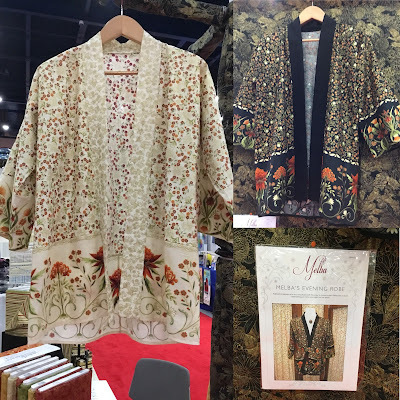 Leesa Chandler, The Textile Pantry, at 2017 Fall Quilt Market. A few examples of her project creations. Overlander Bag featuring Under the Australian Sun fabrics. 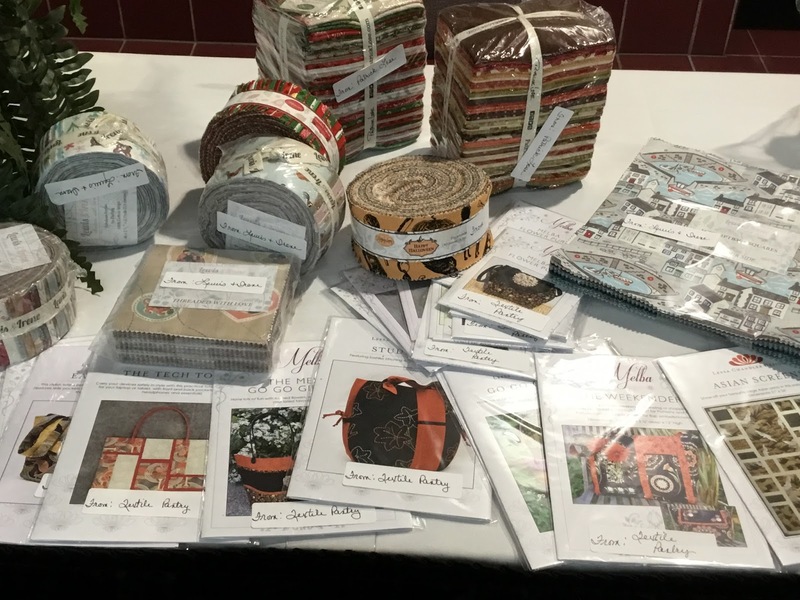 The Textile Pantry donated several patterns to support the One Stop Shop Hop that was held this weekend at the north Georgia Dalton Convention Center. Congratulations to the lucky winners of the door prizes. Textile Pantry patterns at the One Stop Shop Hop. 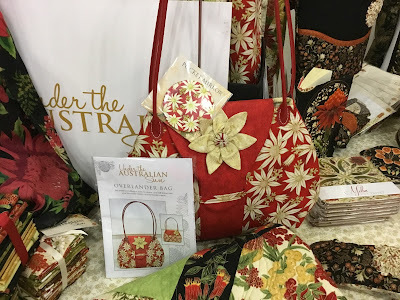 You can find Leesa’s fabric collections, Melba and Under the Australian Sun, at these and other quilt shops: Chattanooga Quilts, Sew N So Quilt Shop, Huntsville Sew and Vac, Dizzy Divas Fabric Shop, Stitch N Quilt, Fabrics Galore, Absolutely Fun Sewing, WV Quilt and other quilt shops in your area. 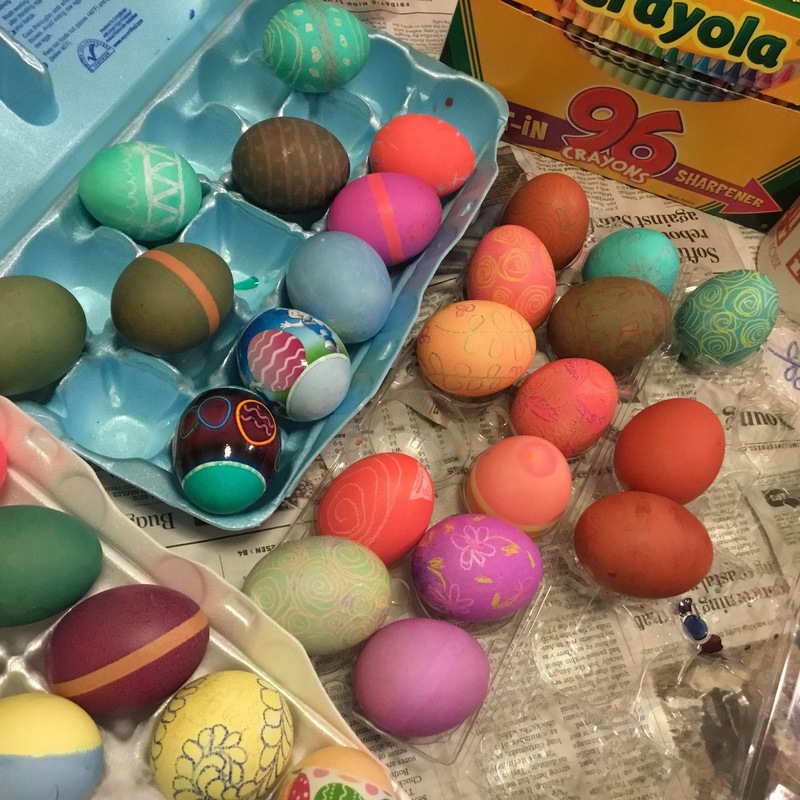 Eggs + dye + Crayola crayons + imagination = fun with color and pattern. 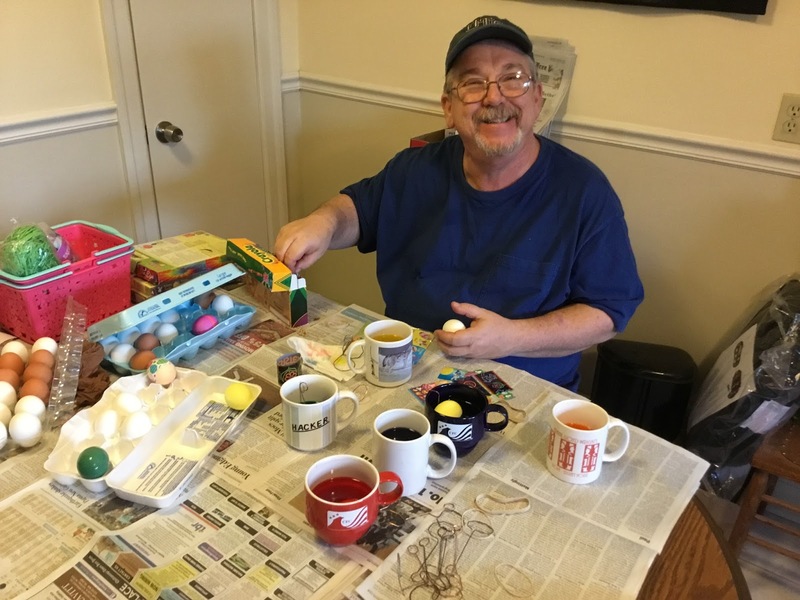 This is the photo sequence to go from white eggs to colored and patterned Easter basket creations. 1. Get someone to color with you. 2. 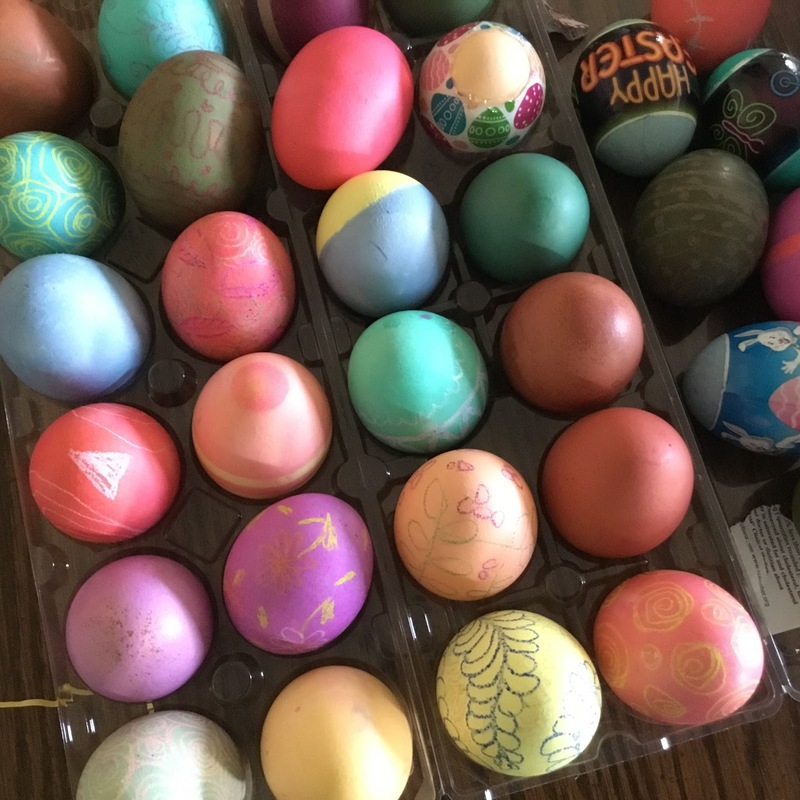 Use crayons from the Big Box of 96 to draw designs on hard boiled eggs. 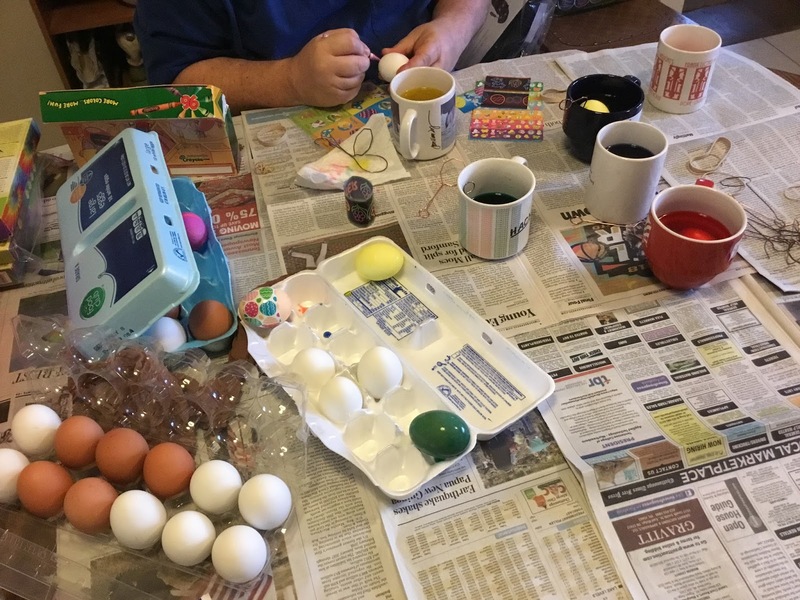 Dunk eggs into the dye to achieve desired color saturation. 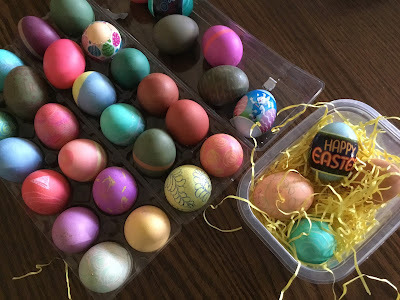 Hard-boiled white and brown eggs ready for coloring. 3. Set dyed eggs in the egg carton to drip dry. Set eggs in the carton to dry. 4. Arrange colored eggs in the baskets or containers filled with paper grass. Add candies and chocolates as desired. Arrange colored eggs in baskets. 5. Give them away and make someone’s day! Have a Happy Easter.